The Brazilian multinational Valid will present its telecommunications solutions during AfricaCom, the largest technology fair in Africa. The event will take place November 15th – 17th in the Cape Town, South Africa. 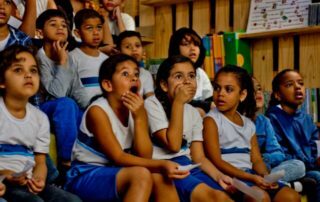 Circuito Cine Curta (“Short Film Circuit”) has been bringing film culture into classrooms for six years, and has now held 600 screenings of new films with 74,200 children and youth from 60 public schools in Rio de Janeiro. Sponsored by Valid and by the government of Rio de Janeiro State, the initiative combines film with education in a learning environment, bringing small award-winning Brazilian productions to students aged 4 to 18 from state and municipal schools from all over Rio de Janeiro State.